the one on the west side. 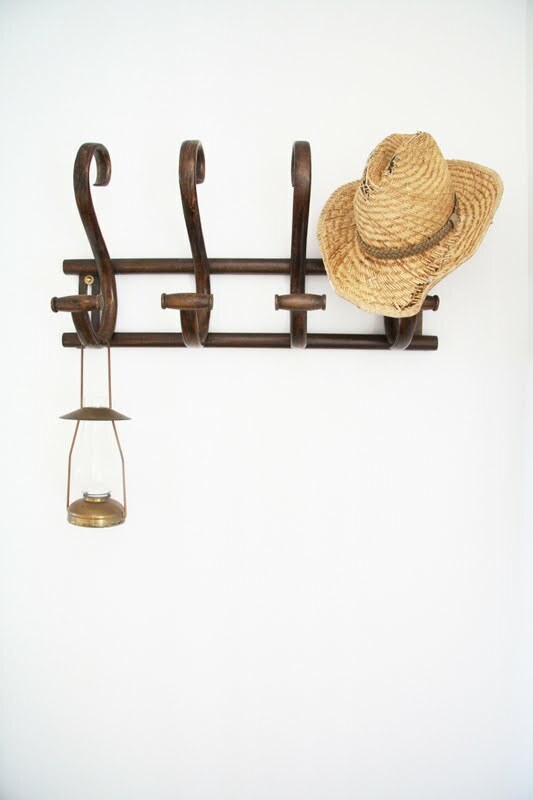 I found the antique hat rack years ago in an antique store. I hadn't been looking for one but the shape was so beautiful and the price so affordable ($45), that I knew I'd find a use for it. closet - which is often. I've always loved this lantern, but it has spent most of its time on a shelf in our downstairs den closet. Though we rarely use it, it's not in the way and I like being able to look at it everyday. 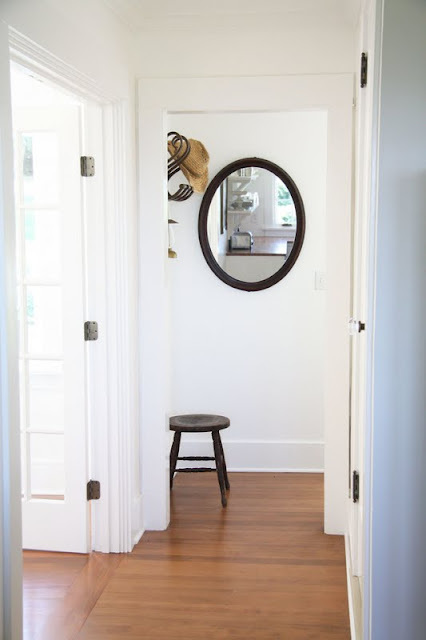 Below the hat rack, we have a stool to sit on while putting on our shoes. We also use the stool to get things off the kitchen shelves, or any other task that requires a high reach in this area of the house. On the wall next to the hat rack is one of my Great Great Grandmother's mirrors. Originally part of the tall dresser in our master bedroom, we've used it here because it does not fit beneath the sloping ceiling upstairs. Entering the hallway from the entry, the french doors on the left open into the dining room. On the right is the door that goes upstairs. 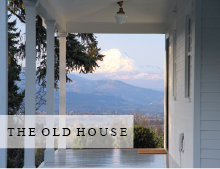 Because there are two entries to the house, we decided to connect them in a more aesthetically pleasing way with a wraparound porch. 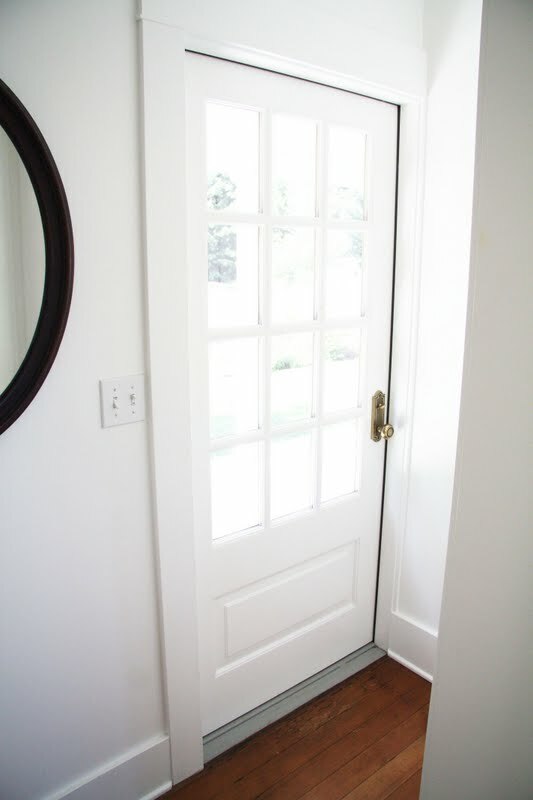 In this way, both entrances are accessible, depending on the occasion (formal or casual). Thanks for such a nice post. I love seeing pictures of your home, it's so beautiful. You really have a lovely home! It's open and airy and I love the details. Love that little lantern, too! the sheer simplicity is just so beautiful......timeless, beautiful and tasteful. love your style and way as always! I love how simple you've left this entryway. And the lantern is the perfect little accessory. I noticed the hat rack in your last post and thought it was beautiful. Very simple yet beautiful! What a lovely entryway. 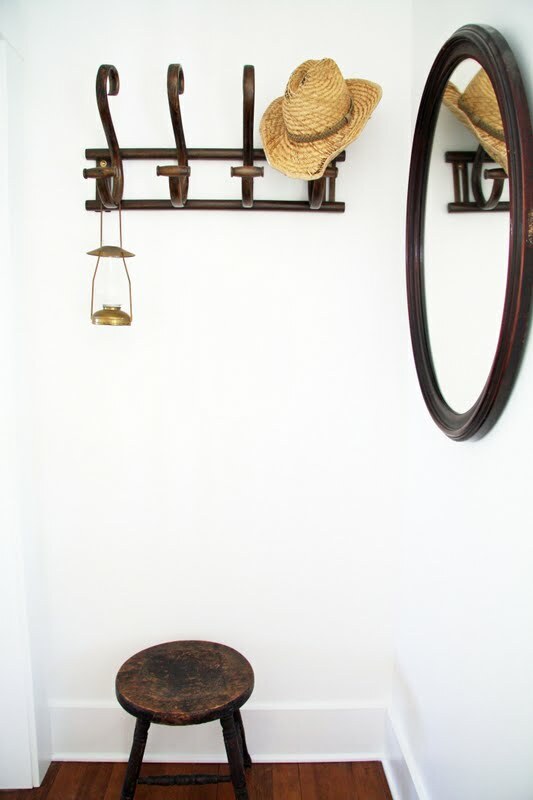 I love the hat rack, and lantern. You did a super job with the mirror. Just love it!! I too love your entry-it is so simple and striking! Somehow reminds me of days past. I'd love to see your whole home, in person 8-). Love, love the entrance, is simple yet beautiful, perfect combination! One of these days when I'm in those parts, I'm going to finally see those butcher block counters in person. I love seeing the photos of your home. Your home is so beautiful!!! AND the white looks wonderful! In our Amish farmhouse, currently most all the rooms are painted white. I keep going back & forth on whether to paint or not. Would LOVE your input on this? Only if you have the time, of course. I'm sure those twins keep you very busy! I envy your ability to use restraint! love this! You are a master at capturing the mirror without you in it! As usual, your home is simply elegant! Love the rack and the contrast of the dark woods against the white. So clean and fresh. When I saw peeks of that entry on the post for the Country Living shoot, I was hoping you'd do a post on it. Truly, Trina, your home is so simply lovely it makes me want to clear out everything and drench my home in white. Just beautiful. We have also same stool and using for to sit on while putting on our shoes. As well as my sister also also like to use that to get things off the kitchen shelves, or any other task that requires a high reach in this area of the house. What a beautiful home! 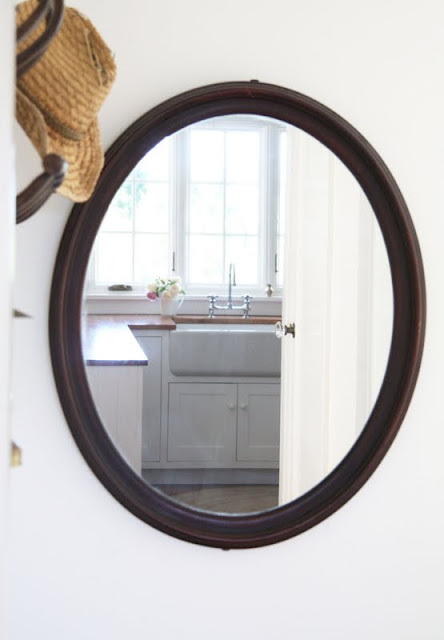 I just love the way your grandmother's mirror reflects the kitchen. Beautiful photo. What a beautiful entry! The antique hat rack is a great touch. I just found you through No Minimalist. I don't know how I've missed your blog all this time. I had seen your kitchen on Pinterest but it was not linked to here. Love your home. I can't wait to see it in Country Living this December! I'm your newest follower and adding you to my blog roll.